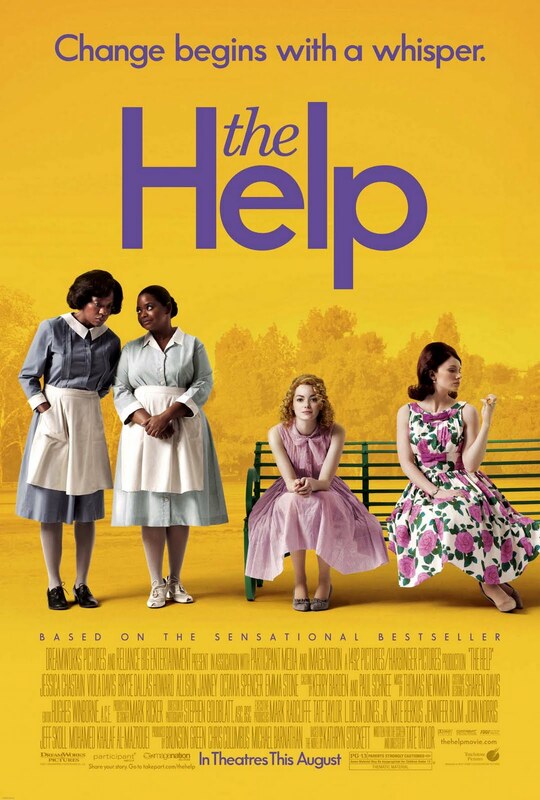 Adapted from Kathryn Stockett’s best-selling novel of the same name, ‘The Help’ is a moving, heart-felt movie about a small number of black maids in rural Mississippi in 1960s who have decided that their voices should also be heard in the painful wake of the African-American civil rights movements. At times deeply sad, at times hilariously funny, this film will grab one’s attention almost immediately and will not let go until the very end. With a great script, masterfully and effectively communicating voices which should be heard in the political movement at that time, ‘The Help’ is a movie not to be missed. Directed by Tate Taylor and produced by Chris Columbus (‘Home Alone I, II’, ‘Harry Potter I, II’), ‘The Help’ centres on Eugene Skeeter Phelah (Emma Stone), an aspiring writer/journalist at the Jackson Journal, who is also a rich white damsel from a prominent family. Thinking (and feeling) quite unlike her friends about many things in life, Skeeter befriends two black servants, Aibileen (Viola Davis) and Minny (Octavia Spencer) from her friends’ houses and starts to interview them in secret about their daily job for her new book (a collective memoir). As stories of the black maids’ daily chores, including household secrets, are spilled for the first time, turning into a fascinating read, the interest to share their lives spreads rapidly among the town’s many maids. In terms of inducing the feelings of nostalgia and the conviction of doing a right thing, the film is very successful, maybe falling slightly short of the level of Wilberforce fighting to abolish slavery in ‘Amazing Grace’ (2006), but definitely topping ‘White Dog’ (1982) and ‘Hairspray’ (1988). The black maids in ‘The Help’ often find themselves in “humiliating” situations, for example, there is a scene where a maid is fired because she used her white employer’s toilet, but there are many others similar situations. Generally, the film provides an interesting insight into many racial issues, which sometimes even open-up some of the contradictions which existed in the situation of a black nanny carrying for a white child. Equally important here is Eugene Skeeter Phelah’s story. Skeeter is a woman who is “ahead of her time”. She wants to be an independent, “professional” woman. She craves financial independence and spiritual freedom. She aspires to write and be a journalist, when it is customary for young ladies her age in 1960s to be housewives. She is also “ahead of her time” regarding racial issues, including the racial segregation prevalent her own town, Jackson, and secretly opposes the practice. There is also no surprise that she associates herself with the black community in Jackson, Mississippi, because, similar to black people there, she feels trapped in a society governed by “silly” societal rules and conventions. In that way, she also has her own story to tell in her new book “The Help”, drawing a lot of material from her childhood memories dominated by her black nanny, Constantine, who brought her up and inspired her when she was little. From the Academy Award-nominated film ‘To Kill a Mockingbird’ (1962) to ‘The Colour Purple’ (1985) and ‘Mississippi Burning’ (1988), films about race and prejudice have always had their lion share of popularity (for my list of “human rights”-themed films see here). As ‘The Help’ has discrimination, violence and civil rights as its theme, one cannot resist but make a comparison with another similarly-themed film ‘Driving Miss Daisy’ (1989), which incidentally was nominated for nine Academy Awards in 1990, and grasped four of them, including one for Best Picture. Both ‘The Help’ and ‘Driving Miss Daisy’ are moving and “honest” in their representation of the issue. However, ‘Driving Miss Daisy’ does not really have the topic of civil rights in its upfront agenda, focusing more on the relationship between black driver Hoke Colburn (Morgan Freeman) and his elderly employer, Daisy Werthan (Jessica Tandy). Maybe this is the reason why it seems that ‘Driving Miss Daisy’ “tops” ‘The Help’ and triumphs as a better film. ‘The Help’ focuses on racial segregation more intently, and, thus, inadvertently, has its fair share of some “heavy”, unrealistic stereotypes’ portrayals. On the other hand, although ‘The Help‘ does portray white people as arrogant and carefree, and black people as “kind souls” and hard-working, it is unfair to say that the movie is overly stereotypical. Eugene Skeeter and Celia Footer (another rich white girl) are portrayed as being very nice, and they show a great amount of sympathy and respect for their black employees in the movie. Besides, there is a scene in the film where a black maid steals a golden ring she has found near the sofa at her white employer’s house. ‘The Help’ will surely elicit a smile and laugh from time to time. It is a very heart-warming film and has many funny moments. For example, there is a line said by Aibileen as she shares her bunter with Skeeter, which goes:…‘Alton (little boy) used to be always be askin’ me how come I was black? It just ate him up. Then one time I told him it’s cause I drank too much coffee’. The sense of camaraderie developed among women in ‘The Help’, as they gather together to share their experiences, can even remind of some of the most moving scenes found in ‘Steel Magnolias’ (1989). In terms of acting, Viola Davis gives a superb and emotionally-charged performance as Aibileen Clarke, truly deserving her Academy Award nomination. Octavia Spencer and Emma Stone are also excellent in their respective roles.